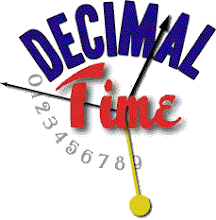 Decimal time was the law of the land for only a brief time. In 1793, during the French Revolution, decimal time was declared mandatory for public acts, starting on 1794 September 22, or 1 Vendémiaire, year III, in the new calendar. However, the law establishing the metric system on 18 Germinal, year III, (1795 April 7) suspended mandatory use just six months after it started. This did not entirely kill decimal time, though. It still continued to be used in some parts of France, such as Toulouse, for a number of years in official records, perhaps until Napoleon abolished the new calendar at the end of 1805, or maybe when ten-day weeks were dropped in 1802. ...l'instant du passage au périhélie, sept.29j,10239, temps moyen compté de minuit à Paris. In English, that's "...the instant of perihelion passage, Sept. 29d.10239, mean time counted from midnight at Paris." This became common practice by astronomers, with French astronomers using mean time in Paris and British astronomers using Greenwich mean time. After the British astronomer John Herschel proposed Julian days, astronomers added decimal fractions to Julian days, creating Julian Dates, which are still in wide use in astronomy, along with variants such as Modified Julian Dates. Calendar dates with times given as decimals of a day in Universal Time have been used in astronomical circulars for the past century. Others, such as computer programmers, also use decimal fractions of a day to represent time. So these modern applications of decimal time can be linked, through Laplace, to the decimal time established back in the 18th century during the French Revolution, and possibly inspired the stardates that are projected in future centuries. Octidi 8 Ventôse an CCXVIII à 2hd 41md t.m.P. I have posted several pages on this site which were on the old site, links to which may be found at the top of this blog. They are still a work in progress, and I have to fix all the internal and external links and make other updates. I also made changes to the decimal times in the sidebar. For the local decimal time, I now use the Excel (for PC) serial date, which includes local time as a fractional day, the same as the calendar date in the title bar. I also moved the French republican date (Calendrier Républicain) into the same gadget and made it update with decimal seconds. I have heard people making fun of the iPad because of the similarity to a feminine hygiene product, never mind that "pad" is a generic term that has many other uses. For one thing, it's sounds the same as very similar devices on Star Trek! Only according to Memory Alpha, the Star Trek wiki, it's spelled PADD, which stands for Personal Access Display Device. Most likely, this is really a backronym, just as another Apple product, the Lisa, supposedly stood for Local Integrated Software Architecture, even though Steve Jobs's daughter also happened to be named Lisa. The name iPad may have been chosen so that all three devices have the same first two letters, iPod, iPhone and iPad. I think that from now on I'll just call them collectively iP. "The Holidays" are considered to be at the end of the (solar) year, but around the beginning of the year there are a series of holidays which are based upon the phases of the moon. These are determined according to various lunar calendars, which are sometimes called luni-solar calendars, because they are periodically adjusted by adding months to keep them somewhat synchronized with the solar seasons. The Economist online, of all places, posted an article on January 15 (55211) titled Decimated: What if Napoleon hadn’t abolished decimal time? The article talks about decimal time, the Egyptian calendar, decimal angle, etc. It is not entirely accurate. For instance, Napoleon did not abolish decimal time; it came and went before he came to power, although he did abolish the ten-day week. And dual-face decimal clocks were not numerous in France in the 19th century, and certainly not elsewhere; almost all of them were made in the early 1790s. It does mention Lagrange's suggestion for déci-jour and centi-jour, but he did not "try in vain" to get these as part of the metric system because France already had decimal time units. As for the "compass", decimal angles called "grads" are actually common on calculators today, although I am not sure who uses them. (The "gon" mentioned in the article is another word for the same thing.) Then the article goes into hexadecimal time. I'm not sure who uses that, either. Unix time and Microsoft's filetime are mentioned, but not other systems, such as Microsoft Excel's decimal time and date. Tridi 13 Pluviôse an CCXVIII à 5hd 51md t.m.P.